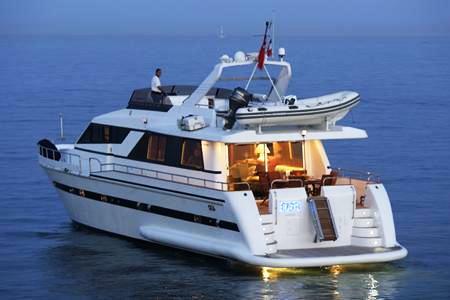 South Pacific crewed motor yacht ROA was built in Italy by Falcon Yachts in 1987 and has had a total refit between 2006 and 2007. 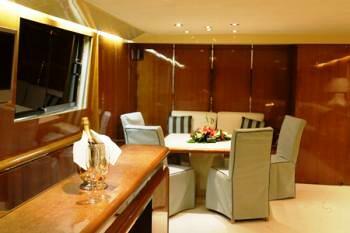 The yacht offers a simple and elegant interior and exterior typical of a Falcon design. ROA is a fast ship, offering a maximum speed of 25 knots and a cruising speed of 20 knots with an average fuel consumption of 250 liters per hour which will enable you to choose from many great itineraries incorporating all of the French Polynesian Islands. 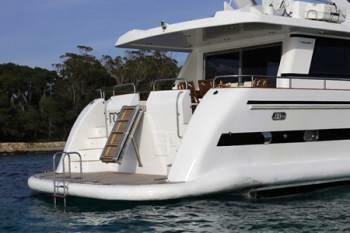 The motor yacht ROA can accommodate up to 8 guests in 2 double and 2 twin cabins perfect for families with children. 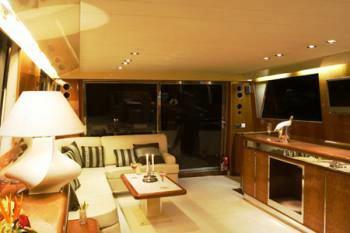 Her simple and stylish saloon has a comfortable L shaped lounge, a wet bar, LCD TV and a dining area further forward. 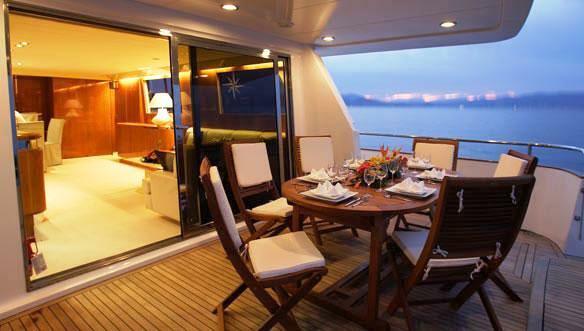 On the Aft deck seating for 8 guests allows shelter and amazing views of the clear turquoise water, seen even in the evening with the help of the aft deck flood lights under the water. The crewed charter yacht ROA also has ample room for sun lovers on the top deck where you can listen to your favorite tunes on the Stereo. 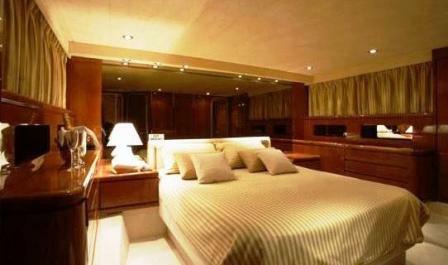 The yacht is air-conditioned throughout. 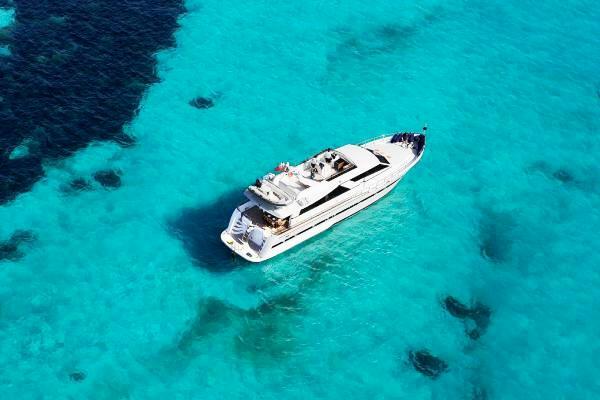 Luxury motor yacht ROA provides the opportunity to charter in the beautiful untouched islands of French Polynesia. 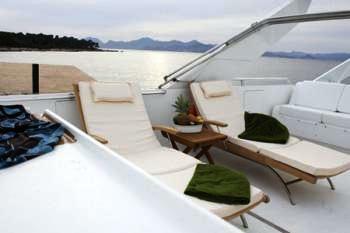 Based in Bora Bora, she is also available in Tahaa, Raiatea, and Huahine upon request. 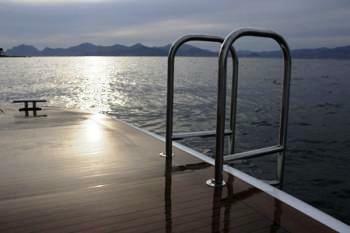 The charter rate of EUR 31,500 remains constant throughout the year. Please contact us for further details on Tahiti tax and the APA or expense allowance. 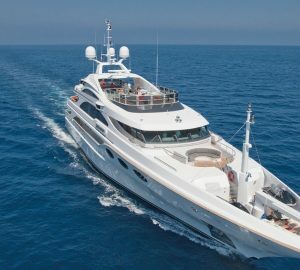 Motor yacht ROA offers yacht charter guests accommodation for up to 8 guests in four cabins including the master stateroom which stretches across the full beam of the yacht and a further double cabin and two twins. The crew accommodation area is located forward.